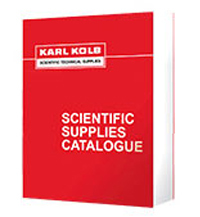 Thank you for your interest in the Karl Kolb product portfolio. Our expert buyers are constantly looking for the latest technological developments and upgraded solutions – from consumables to complete installations. The best articles are added to our catalogue, which comprises more than 1,000 pages and lists 40,000 items. The catalogue is available as a print version and online. Please note: Our Digital Scientific Supplies Catalogue comprises consumables, glassware and standard lab equipment. However, our product range also comprises high sophisticated analytical laboratory and other equipment to complete any kind of laboratory. Please feel free to send us your requirements by completing the following form. A sales advisor close to your office will contact you as soon as possible after we have heard from you.